Copyright © 2017 The Fit Foodie, All rights Reserved. What’s Yoga Teacher Training Really Like? Is your partner affecting your eating habits? Behind The Scenes of a Street-Style Shoot – BLOOPER ALERT! Love Move Eat is your unforgettable guide to living your best life. 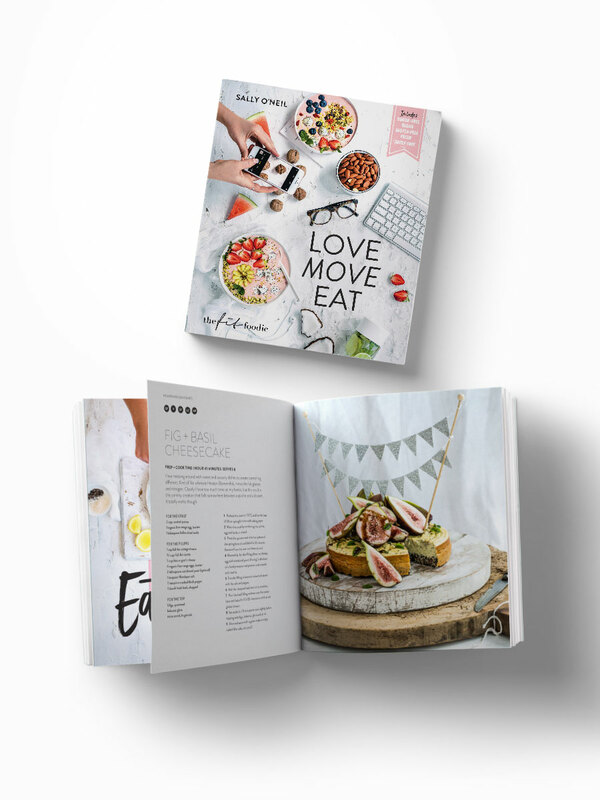 This paperback book features over 70 delicious and healthy guilt-free recipes split by sweet and savoury treats, allowing you to enjoy a little of what you love, every day. Think healthy hot chips, donuts, pop tarts, wagon wheels and more! Order 2 books for a 5% discount! Head to Book Depository right here to order for FREE worldwide shipping! This is not a diet. After dropping 14 kilos through a new approach to food, Sally O’Neil knows the key to feeling fabulous is re-inventing your favourite treats with healthy ingredients. Based on her award winning blog The Fit Foodie, this book contains more than 70 delicious recipes using simple, wholefood ingredients, as well as practical tips on how to maintain your health and wellness outside the kitchen. Love Move Eat is your unforgettable guide to living your best life. 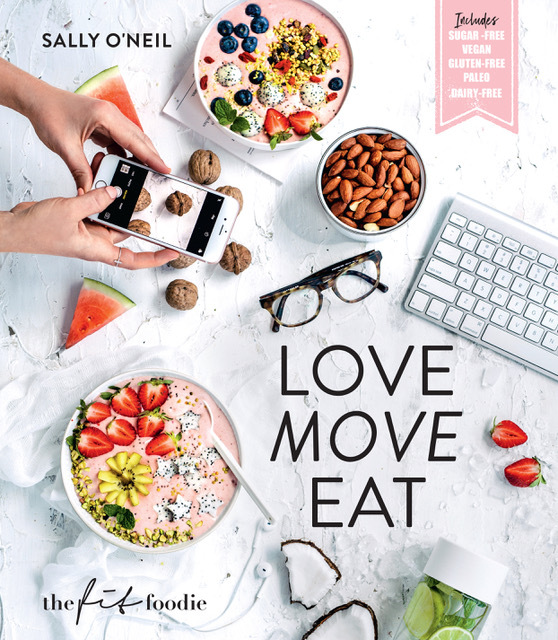 It features over 70 delicious and healthy guilt-free recipes split by sweet and savoury treats, allowing you to enjoy a little of what you love, every day. Think hot chips, donuts, pop tarts, wagon wheels and more! Snacks, Light + Fresh, or Nourishing. Beautiful photographs for every single recipe, so you can present it perfectly every time. Handy shopping list so you can stock your pantry for a healthy life! ....plus heaps more health and wellness tips! Love Move Eat needs your help to be a success. By ordering this book, you keep Sal doing what she loves and producing more content for you guys right here on the blog. The bigger the demand for Love Move Eat, the more stores we can reach, the more homes it can be shared in, the more lives we can impact. All orders will receive free shipping Australia wide. The basic package is the book itself, but you can also choose to order the book with Fit Mixes protein balls too and save save save! Order now and be one of the first to receive a book from the very first print run. To say thank you for helping me make this book a reality, I'm are offering free delivery Australia-wide. Want more than just the book? I’ve got you covered! Get the book and a packet of my delicious COOKIE DOUGH Protein Ball Mix from Fit Mixes (vegan, sugar free, diary free) which is featured in my Cookie Dough Ice-Cream recipe! You'll also get free delivery Australia-wide. Not satisfied with just the book and the healthy Fit Mixes Cookie Dough? How about the Chocolate + Chia and Vanilla + Coconut mixes as well for healthy snacks all week long? And you get free delivery Australia-wide if you order now!